As usual this proved a popular meet, which has more to do with the dinner than the location. The Friday night was calm and clear outside, so much so that Gillian decided it was too nice to sleep in the hostel and promptly pitched her tent in the garden, to come back a few moments later complaining about the midges, no surprise there then. 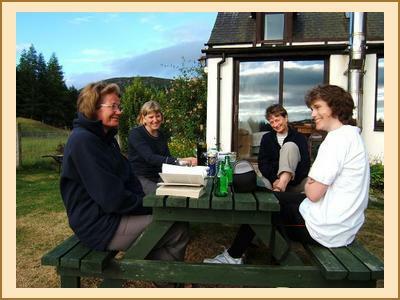 After everyone had got their porridge oats on the Saturday morning, people disappeared in various directions, most getting an unusually early start with yours truly being last to leave the hostel with Anne, Val and Cath. We headed on to the Feshie ridge which was initially clear but on gaining the first top we soon headed into cloud and for the rest of the day followed the needle of the compass. When we reached Mullach Clach a Blair we bumped into Margaret, Fiona and Gillian, which at first made me wonder if my navigation had gone horribly wrong as when they had left the hostel I'm sure they mentioned doing Angels Peak and Cairn Toul. A few steps further and we came across Tim and Pat who had just been on Monadh Mor and Beinn Bhrotain. Albert, Judith and mountain dog Sam had also been on Mullach Clach a Blair, which meant that out of 14 people on the meet, 11 had been on this rather dull but seemingly popular hill. On reaching the floor of the Glen we saw Anne Craig who had completed an impressive round of the three corbetts at the head of the glen and took great delight in the fact that she had been out of the cloud virtually all day. Back at the hostel we waited impatiently for the gourmet feast while listening to Bill Brown talk about his roadkill exploits which ranged from pheasant to hare and deer, how he came to be an expert at skinning such animals was a little less clear but if you're a deer & crossing the road in the vicinity of Bill take extra care! 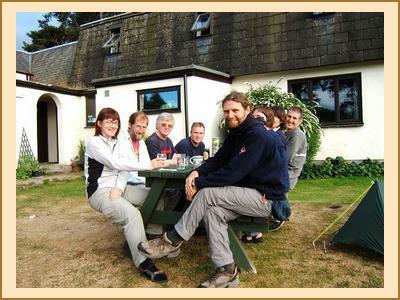 During this time we still awaited Bill and Eileen who had set off on an epic of a day to bag the remote Corbett Beinn Bhreac, with impeccable timing they walked into the hostel just as Jean was serving the soup. As always the food from Jean was fantastic, although despite our best efforts and in particular Pat, we couldn't quite finish off the pudding. We all slumped into chairs with full but contented stomachs and it didn't take long for bed to come calling. The next day was showery but in the main, the Cairngorm tops remained clear. Anne and I took the mountain bikes from Loch Morlich to Nethybridge and back past Ryvoan Bothy while others stuck to the hills with A`Bhuidneach Beag, Carn na Caim and Binnein Shaus being on the list of hills ascended. No doubt we will back next year for another feast. See below for the soup recipe. Saute celery, onion & potato for 10 mins. Add chopped tomatoes, orange juice, stock & simmer for 30 mins. Add basil. Liquidise & sieve. Serve.